Well, it has to be seen to be believed, frankly. Giving the title a whole new meaning, one that World War II buffs should have no trouble guessing, the moment is almost too tasteless for words. (We’re in Extremely Loud And Incredibly Close territory here, people.) Yet long before Little Boy has gone full-tilt over the edge, flirting with treating a grand-scale tragedy like a miracle, it’s revealed itself to be the kind of inspirational entertainment that would rather feed its audience comforting platitudes than deal with the tough questions a handful of its characters raise. Here, faith is not a tool for self-improvement or a route to inner peace, but a kind of magic ticket, making all dreams come true. God may work in mysterious ways, as one devil’s advocate reminds, but movies like this do not. There is only one way it can end. 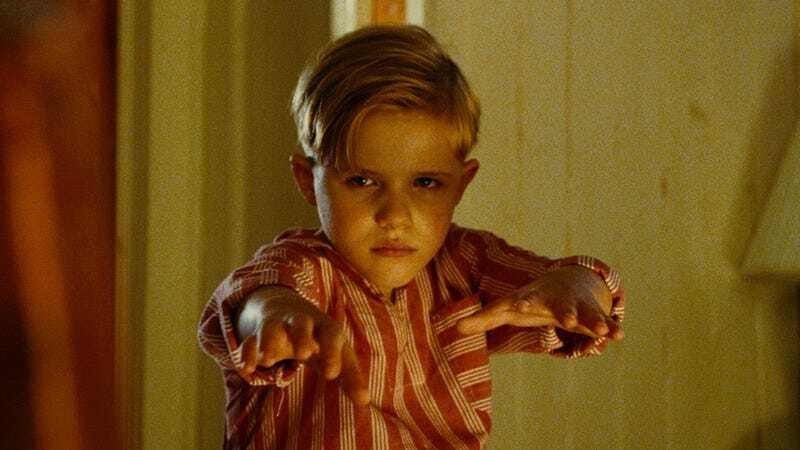 Set in a fictional town on the California coast, before and a little after the bombing of Pearl Harbor, Little Boy presents a nostalgically overlit home front. (“Just like you see in postcards,” the folksy narrator helpfully notes.) Here, Pepper and his beloved pop (a pudgy Michael Rapaport, playing one of those idealized movie dads who’s really a kid at heart) disappear into elaborate playtime adventures, which director Alejandro Monteverde visualizes as chintzy cowboys-and-pirates interludes. They’re no phonier, really, than the brief glimpses of “real” combat he eventually cuts to—or, for that matter, the film’s gauzy vision of small-town America. Speaking of fake, there’s the film-within-a-film magician Ben Eagle (Ben Chaplin) screens before his show. It looks exactly like what it is: a clumsy facsimile of “old cinema,” featuring both spoken English dialogue and random, silent-era intertitles. Once dad gets shipped off to the frontlines, having agreed to take the place of flatfooted older son London (David Henrie), poor Pepper becomes fixated on the idea of willing his safe passage home. The town priest, Father Oliver (Tom Wilkinson), sends the mopey moppet on a kind of spiritual scavenger hunt, handing him a list of dictates like “Visit the sick” and “Feed the hungry.” The most important of these tasks, he insists, is the befriending of an elderly Japanese immigrant named Hashimoto (Cary-Hiroyuki Tagawa), who the rest of the community treats like a traitor in their midst. “Your faith won’t work if you have even the slightest bit of hate in you,” Father Oliver insists, and so Pepper begrudgingly shadows the old man, until a bond slowly develops between them. It’s the most admirable passage of the movie, mainly by virtue of the friction it creates between the idyllic wartime imagery and the racism of the townspeople. Unfortunately, Monteverde directs these moments—and every moment, really—with all the subtly of someone playing church organ with a sledgehammer. The bombast reaches hysterical levels early and often. One scene thunderously crosscuts between Pepper getting knocked around by bullies and his dad being captured by Japanese soldiers. Another finds the boy dreaming of walking through the ruins of a devastated city, his clothes vibrant against the desaturated rubble, like the girl with the red dress in Schindler’s List. You end up just feeling sorry for the performers, wringing a few drops of honest emotion from this egregiously sentimental material. Both Tagawa and Wilkinson are excellent, especially when seated across from each other, debating finer points the film won’t otherwise address. And Emily Watson brings a certain steely dignity to the thankless role of Pepper’s vigilant mother, even as the film often asks nothing more from her than uncontrollable sobbing. (A decent chunk of the running time is devoted to people blubbering in close-up.) But no amount of fine acting can save Little Boy from the empty catharsis of its ending, which again treats faith like a blank check waiting to be cashed. “Believe the impossible,” the tagline commands. It’s a promise this shameless film has no intention of breaking. 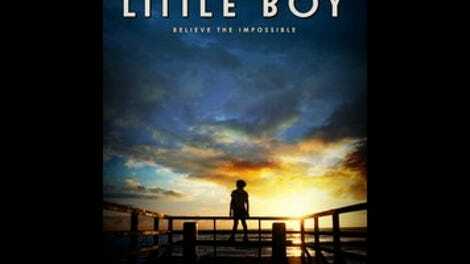 For thoughts on, and a place to discuss, plot details not disclosed in this review, visit Little Boy’s Spoiler Space.